The Standing Stone - ZineWiki - the history and culture of zines, independent media and the small press. The Standing Stone was a small press publication edited by Gordon R. Menzies and published by Ebenrock Enerprises. 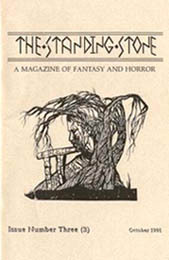 Subtitled "The Magazine of Fantasy and Horror", The Standing Stone was published in the 1990s in Ontario, Canada. Contributions of art work come from Clay Boutilier (Lost), and Margaret B. Simon (Star*Line), who did the cover for issue three, from October 1991. Contributions of writing come from C. Darren Butler (Magic Realism, A Theater of Blood), John Grey, Herb Kauderer, Nancy Kilpatrick, D.F. Lewis (Nemonymous), Kim Laico, Dale L. Sproule (TransVersions), and Adam Thornton (Lost). Gordon R. Menzies is the author of several works of short fiction, and later produced several books, including The Lonely Isle, The Bones of Deer, and The Art of Robert David Menzies 1953-2007. This page was last modified on 2 November 2012, at 19:42.